Figure 1. FHB on some wheat heads. Note the bleached and reddened appearance of infected kernels. 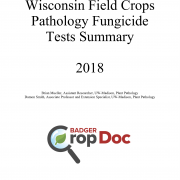 Fusarium head blight (FHB) or scab has been observed in some Wisconsin winter wheat fields this season. Incidence and severity have been variable this season, based on location and susceptibility of the wheat variety. 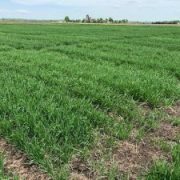 Generally, we have observed more FHB in the southern wheat growing areas of the state, with less FHB as we moved north and east. Visit my previous post for a full report. 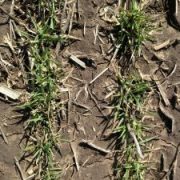 It is important to scout your maturing wheat crop and consider how much damage from FHB might be in a field as you prepare for harvest. While FHB can cause direct yield loss, the fungus that causes this disease can also produce deoxynivalenol (also known as DON or vomitoxin). 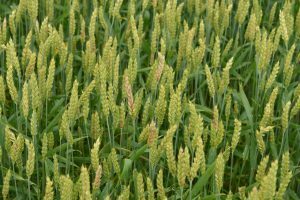 Assessing wheat fields now can assist you in determining how much vomitoxin might be expected at harvest. 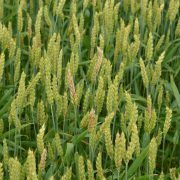 However, it is possible to find high levels of vomitoxin in finished grain, even if FHB levels where low. What does scab look like? Diseased spikelets on an infected grain head die and bleach prematurely (Fig. 2). Healthy spikelets on the same head retain their normal green color. Over time, premature bleaching of spikelets may progress throughout the entire grain head. If infections occur on the stem immediately below the head, the entire head may die. As symptoms progress, developing grains are colonized causing them to shrink and wrinkle. Often, infected kernels have a rough, sunken appearance, and range in color from pink or soft gray, to light brown. As wheat dries down, visual inspection of heads for scab will become more difficult. Scout your fields now to assess risk. Wheat is maturing rapidly. As maturity progresses it will be increasingly difficult to assess the incidence and severity of the infection. Understanding a field’s risk will help growers either field blend or avoid highly infected areas so entire loads are not rejected. Scabby kernels does not necessarily mean high DON levels and vice versa. For example, in a 2014 fungicide evaluation very low visible levels of FHB were observed for all treatments. However, when the finished grain was tested for DON, significant levels were identified for all treatments. Be sure to test and know what levels of DON are in your grain even if you didn’t see a high level of visible disease. Also, don’t assume that because a fungicide was used, there will be no DON. Harvest in a timely fashion to minimize elevator discounts and balance dockage due to FHB. 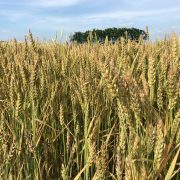 Click here to read about some recent research on optimizing harvest timing in winter wheat. 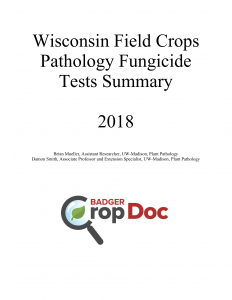 The Wisconsin Field Crops Pathology crew has scouted and rated all winter wheat variety trials across the wheat-growing region of the state. We have also looked at commercial fields for disease in the region. In general leaf diseases will be of minimal impact this season. We have observed a little Septoria leaf blotch in some fields in the lower canopy. However, this pathogen will not limit yield this season, as it has not reached the flag leaf yet. We have also not observed any stripe rust this season. As I mentioned in previous posts, the winter was cold enough with minimal snow cover, which didn’t allow the stripe rust pathogen to overwinter in the region. Subsequent spread from the southern states north, was also not fast enough to reach the crop in Wisconsin to impact yield. If stripe rust does arrive this season, it will not impact yield. Leaf rust was observed at the Arlington (south-central Wisconsin) location. However, it was at very low incidence and severity and will likely not impact yield on most varieties in the state. Figure 2. Fusarium head blight index of winter wheat in small plots where fungicide programs were used in 2014. 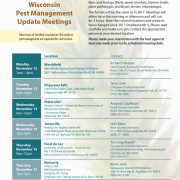 Fusarium head blight (FHB; scab) has been observed at all locations visited. Incidence and severity is highly variable based on location. At the Sharon (southern Wisconsin) and Arlington locations, FHB could be found in some plots at incidence levels as high as 50% with 50% severity. Many plots had low levels of FHB, thus the average levels at these locations was around 10% incidence with severity levels of around 20%. As we moved north and east in Wisconsin, FHB was at much lower incidence and severity levels. 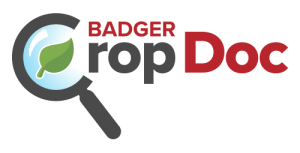 Incidence averaged 5%-10% with severity around 15% at the Chilton and Fond du Lac locations. Commercial fields that we have scouted in these regions fall within these same averages. Figure 3. 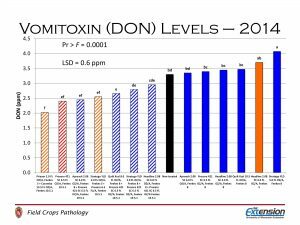 Vomitoxin levels of finished grain from winter wheat small plots where fungicide programs were used in 2014. While I don’t think the FHB epidemic in 2018 will be as bad as 2015, I think it is important to scout fields and understand the levels of FHB present. It will also be important to test finished grain for vomitoxin or DON. Often, the level of visible FHB damage does not reflect the vomitoxin levels of harvested grain. This happened in some fields in 2014, including a research trial that we had at the Arlington location. 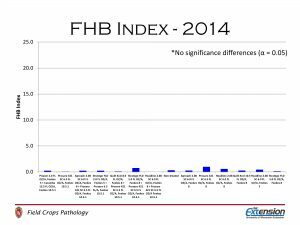 FHB index levels on heads in the field were very low across all treatments in our research trials that year (Fig. 2). However, when the finished grain was tested for vomitoxin, levels were quite high (Fig. 3). There are a number of factors that can contribute to this phenomenon, including time of infection, varieties, weather, and treatment. The point is, be sure this doesn’t happen to you. Scout AND have finished grain tested so you aren’t surprised at the elevator! Fusarium Head Blight Risk for June 6, 2018. 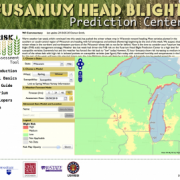 Visit the Fusarium Head Blight Prediction Center to stay up to date on the latest forecasts. 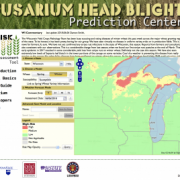 Fusarium Head Blight 72-hour forecast for May 30, 2018. 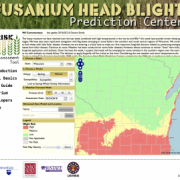 Visit the Fusarium Head Blight Prediction Center to stay up to date on the latest forecasts. 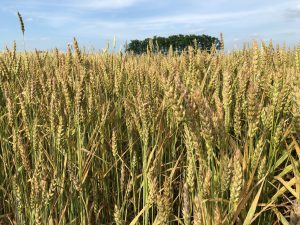 Warm weather last week, which continued into this week, has pushed the winter wheat crop in Wisconsin toward heading.  Most varieties planted in the southern or south-central region of Wisconsin are heading, with full emergence and anthesis (flowering) beginning by the end of the week. We suspect that winter wheat in the northern and northeastern portions of the Wisconsin wheat belt to not be far behind. Now is the time to consider your Fusarium head blight (FHB; scab) management strategy. Weather late last week had driven the FHB risk on the Fusarium Head Blight Prediction Center to a high level for susceptible varieties. Extremely hot and dry weather has forced the risk back to “low” today. However, 72 hour forecasts show risk increasing to medium in much of the wheat belt with high risk in isolated pockets on susceptible varieties (see figure). Rain today, with continued humidity and temperatures in the 80s F for the rest of the week, will keep risk elevated. Areas near the Lake Michigan shore will likely be at high risk. Figure 1. Winter wheat greening up after winter. The Wisconsin Field Crops Pathology crew scouted the winter wheat uniform variety trials located in Sharon, Wisconsin late last week (April 12, 2018) prior to the latest snow storm. This is our most southerly location (near the IL state line), and is often a good early indicator of disease issues for Wisconsin. Wheat was trying to green up a bit, but the latest snow fall will surely set the crop back. With more snow in the forecast for April 18, 2018 it will be some time before we can scout wheat again for disease. That is the bad news. The good news is that we did not find any diseases. With numerous reports of active stripe rust from states in the Mid-south we were concerned that early stripe rust might be present. We scouted known varieties to be susceptible, with no foliar symptoms apparent. 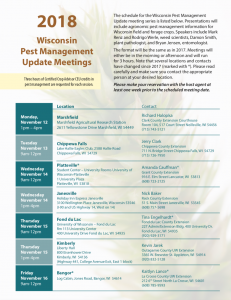 You will remember in 2017, we identified active stripe rust very early in Wisconsin. This was due to overwintering of Puccinia striiformis inoculum from active infections that started in the fall of 2016. We suspect that warmer winter conditions in the 2016-2017 field season allowed P. striiformis to overwinter. Sharma-Poudyal et al. (2014) reported models that predict overwintering of P. striiformis when the 30-day average low temperatures are 14F or above with snow cover, or 21F or above without snow cover. Figure 2. Average 30-day low temperatures, 2016-2017 30-day average low temperatures, and 2017-2018 30-day average low temperatures and P. striiformis survival thresholds under snow cover and without snow cover for Clinton, Wisconsin. Using these thresholds and data from US Climate Data (https://www.usclimatedata.com/) for Clinton, Wisconsin (very close to our research site) in the 2016-2017 field season, we found that the under-snow-cover threshold was not below the 14F mark (Fig. 2). These warm conditions in 2016-2017 likely resulted in overwintering of inoculum at this location during last season. Using the same temperature thresholds and looking at 30-day average low temperatures for the 2017-2018 field season, we find that low temperatures where much more seasonable and were well below even the under-snow-cover threshold in January 2018 (Fig. 2). Thus, the risk for overwintering of P. striiformis inoculum in far southern Wisconsin is low this season. Even if active P. striiformis infections were found in fall of 2017, the likelihood it survived the winter was unlikely; especially considering the low temperatures in January of 2018 with minimal snow cover at this site during that time. We will continue to scout winter wheat fields once snow melts. I would encourage others to get out and scout once the weather improves. Be sure to pay close attention to any winter wheat varieties that are known to be susceptible to stripe rust. Sharma-Poudyal, D., Chen, X., and Alan Rupp, R. 2014. Potential oversummering and overwintering regions for the wheat stripe rust pathogen in the contiguous United States. Int J Biometeorol. 58:987-997.